The first part (hier Link zum ers­ten Teil: Von der Flä­che bis zum Werks­tor) of the arti­cle on our value chain descri­bes what hap­pens to the peat bet­ween extrac­tion site and fac­to­ry gate. Part 2 now looks at the trans­port and logistics aspec­ts and descri­bes the finis­hed substrate’s rou­te from the fac­to­ry gate to the custo­mer. 40,000 trucks, 2300 rail­way wagons, 100 ships and 8800 con­tai­ners: the­se are the loads that Klasmann-Deilmann ship­ped to custo­mers all over the glo­be in 2017. As a glo­bal indus­tri­al play­er, we deli­ver to custo­mers in 70 dif­fe­rent coun­tries. Long-term busi­ness rela­ti­ons­hips with reli­able for­war­ding and trans­port com­pa­nies in our home coun­tries and abroad ensu­re that all orders are hand­led effi­ci­ent­ly and as quick­ly as pos­si­ble. The fac­tor that nor­mal­ly limits the trans­port of gro­wing media and raw mate­ri­als is the weight. For examp­le, in terms of volu­me, a stan­dard truck can car­ry up to 34 euro pal­lets. Becau­se of the weight of our substrates, howe­ver, it is often only pos­si­ble to load 24 such pal­lets onto a truck, which means addi­tio­nal impact on the envi­ron­ment. As sustai­na­bi­li­ty is some­thing we take serious­ly, we are always on the loo­kout for prac­ti­ca­ble logistics solu­ti­ons and fol­low a poli­cy of “water­way befo­re rail befo­re road.” Howe­ver, it is not always pos­si­ble to put this maxim into prac­tice, as we are some­ti­mes con­fron­ted with the limits of what is fea­si­ble and eco­no­mi­c­al­ly accep­ta­ble. As logistics accounts for a signi­fi­cant sha­re of our car­bon foot­print, we intend to make even more effort in future to find solu­ti­ons which have less impact on the cli­ma­te and have rol­led out a num­ber of pro­jec­ts to inves­ti­ga­te ways of redu­cing the weight of our raw mate­ri­als and pro­duc­ts. Ship­ping and inland water­ways: Deli­ve­ries insi­de Wes­tern Euro­pe are made by water­way, whe­re­ver pos­si­ble on inland water­ways. This is a good solu­ti­on for the trans­port of raw mate­ri­als and loo­se goods. As soon as the pro­duc­ts have been sta­cked onto pal­lets, howe­ver, this means of trans­port beco­mes more dif­fi­cult and the pro­por­ti­on of goods dama­ged during the loa­ding pro­cess is rela­tively high. It is vir­tual­ly impos­si­ble to use bar­ges for trans­ports to Eas­tern Euro­pe becau­se of the lack of inland water­ways the­re. The only alter­na­ti­ve is the­re­fo­re to char­ter seago­ing ves­sels. On con­tai­ner ves­sels: Con­tai­ners are the ide­al solu­ti­on for packed goods and play a cen­tral role for con­sign­ments to over­se­as desti­na­ti­ons, which is whe­re many of our important mar­kets are loca­ted. We use only con­tai­ner ves­sels for the­se trans­ports. By rail: We endea­vour to use rail for as much of our trans­port requi­re­ments as pos­si­ble. Our pro­duc­tion com­pa­ny “Pro­duk­ti­ons­ge­sell­schaft Nord” has its own rail­way siding which is lin­ked to the Deut­sche Bahn net­work, which makes this trans­port opti­on basi­cal­ly attrac­tive. Unfor­tu­n­a­te­ly, howe­ver, rail trans­port is often finan­ci­al­ly unat­trac­tive becau­se of the high tranship­ment costs. Ano­t­her nega­ti­ve fac­tor that has to be con­si­de­red for trans­ports to Eas­tern Euro­pe is that it is not pos­si­ble to orga­ni­se through trans­ports becau­se of the dif­fe­rent rail gau­ges. But despi­te all the­se dif­fi­cul­ties, Klasmann-Deilmann still tri­es to make as much use as pos­si­ble of rail for its trans­ports. This claim is backed by the fact that we have set up inte­rim sto­rage depots at selec­ted European tar­get regi­ons, which has also shifted more of our pro­duct trans­ports onto rail. By road: Even if truck trans­port gene­ra­tes the hig­hest car­bon emis­si­ons, road trans­port is still indis­pensable for the time being. 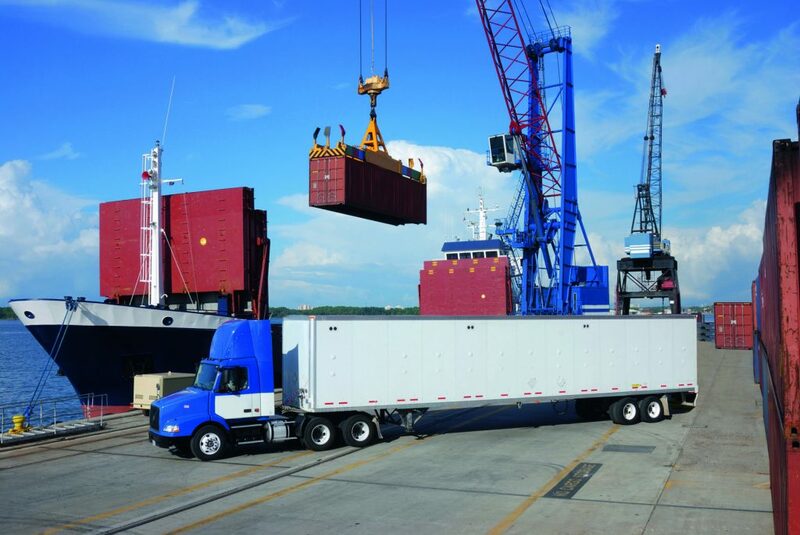 In the case of urgent custo­mer orders – which fre­quent­ly have to be deli­ve­r­ed from one day to the next – road is the first choice for the trans­port. Many orders can only be car­ri­ed out punc­tual­ly if we deli­ver by truck. Moreo­ver, road trans­port is the most cost effec­tive: if we use bar­ges, con­tai­ner or rail, we have to fac­tor in the costs of tranship­ment, as the goods have to be unloa­ded by for­klift or cra­ne at the port or rail­way sta­ti­on. This con­stel­la­ti­on ulti­mate­ly means that the goods near­ly always tra­vel the last mile by truck to reach the custo­mer. Here you can read the first part of our value chain.